In the essay, I briefly allude to a paper I wrote in graduate school while sitting in front of a window that allowed me to observe a tree undergo its annual autumnal transformation. Below—for better or worse—is that paper. I cannot guarantee that it is worth reading, but you should at least consider the text below to be a verification that the paper is, in fact, (frighteningly) real. I wrote it for a rhetoric course I took in the fall of 2001. The same rhetoric course in which I drew these lovely doodles during class just to stay sane. I despised that class even more than I despise going to the dentist. This is the second essay I have written for the 2012 Lenten season. Both pieces relate to the year 2001, and to my love of the Innocence Mission’s Birds of My Neighborhood LP. The other essay, “The Flowering Dark,” is available here. If you read my first essay and remember that I promised to post the second half of a videotaped performance of my sister and I covering Birds of My Neighborhood in its entirety at a house show, you will note that the second half is curiously absent from this post. Chalk it up to technical difficulties. My apologies for that, although you may actually benefit from not subjecting yourselves to our yowling. Also noteworthy: This week I was asked to become a regular contributor to IMAGE’s “Good Letters” blog, where I will be contributing essays alongside one of my writing heroes, Mr. Jeff Overstreet. I accepted, of course, and was honored to be asked. See my author photo and bio here. Without further ado, behold! : My paper on Radiohead and Plato. We live in anticipation of the future. We hope for a better tomorrow and neglect today. Pop culture has long anticipated the world of the future and articulated its voice through the musical ruminations of synthesizers and computer-based music. This raises a few questions. When does this futuristic world that pop music has anticipated for so long actually arrive? When does the music of the future cease to be futuristic and become the music of the present? With the release of OK Computer in 1997, Radiohead announced that the future was upon us. The future that the band proclaimed, however, was far from utopian. The rhetoric of OK Computer reads as an alarm to the world – A call to freedom through philosophical enlightenment. It is the work of a noble lover, leading people to truth selflessly. This document will explore this idea to its completion through a detailed summary of OK Computer, an overview of Plato’s view of rhetoric, and an analysis of Radiohead as the noble lover Plato describes in The Phaedrus. Released in 1997 on Capitol records, OK Computer garnered enormous critical acclaim, sold 5.5 million copies and received a Grammy award for Best Alternative Music Performance (Clarke, 2000, p. 133). Since its release, it has charted on numerous “Top Albums of All Time” lists in magazines such as Rolling Stone, Spin, Q, NME and Alternative Press. What is at the heart of this phenomenon? We will begin this exploration by examining Radiohead and the music and message of OK Computer. Radiohead is an English quintet comprised of vocalist/guitarist Thom Yorke, lead guitarist Jonny Greenwood, guitarist Ed O’Brien, bassist Colin Greenwood and drummer Phil Selway (Godrich, 1997). The band’s first two albums, Pablo Honey and The Bends, established them as vital contributors to the alternative rock movement of the 1990s. With the release of OK Computer, the band’s third album, Radiohead surpassed its peers by light-years and set a new artistic watermark for modern music. Musically, OK Computer is a panoramic, epic album that explores the surreal terrain of an emotional netherworld of futuristic art rock. Influenced by classical music and Miles Davis, the songwriting is beautiful, elegant and complex (Clarke, 2000, p. 113). Throughout the album, however, the presence of uneasiness fogs the soundscape as otherworldly noises hover just above the horizon. The result is simultaneously compelling and unnerving. According to Thom Yorke, this was intentional. “I think people feel sick when they hear OK Computer,” he said. “Nausea was part of what we were trying to create” (Clarke, 2000, p. 128). 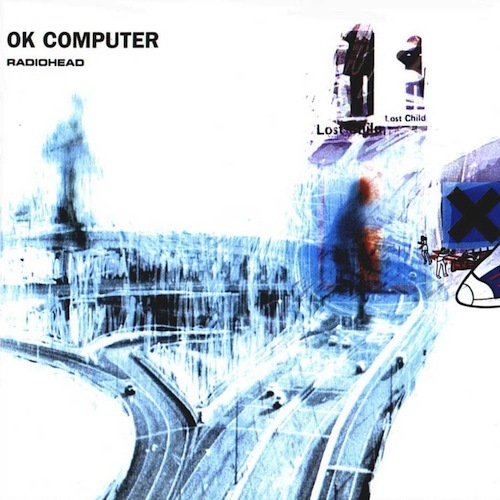 The message of OK Computer is set in the context of Radiohead’s worldview. Lyrically, the album is “driven by a feeling of impotence with the world around it … The world speeds around on an axis of its own, and there’s nothing you can do about it” (No Author, 1997, p. 1). The world is moving too fast, business is “(replacing) human emotion and personality with robotic behavior,” politics are superficial and manipulative, and technology is humanity’s two-faced friend and fiend (Schreiber, 1997). Indeed, the world depicted in OK Computer is the ideological opposite of the utopia discussed in Plato’s Republic. The term “dystopia” appears to capture the essence of the picture Radiohead paints. According to Webster’s New World College Dictionary, this term is defined as “a hypothetical place, society, or situation in which the conditions and the quality of life are dreadful” (Neufeldt & Guralnik, 1996, p. 424). An OK Computer companion documentary video released in 1998 titled Meeting People Is Easy provides us with additional insight into the worldview expressed on the album (Gee, 1998). Passersby and vehicles race by at ridiculous rates as a result of high-speed film edits. In the midst of this exploding world, Radiohead is depicted as quiet and detached, isolated from the bustling activities of the modern world. Indeed, the members of Radiohead are portrayed as the only people who are enlightened enough to be aware of the plight of the world. This consciousness positions them as modern prophets; the lone spokespersons of a world gone amiss and the only people able to write songs about it. The resulting message to the world identifies escape as freedom (No Author, 1997, p. 2). From an expressed longing for alien abduction in “Subterranean Homesick Alien,” to the concept of rebirth in “Airbag,” to the title of “The Tourist,” which suggests that the members of Radiohead feel like strangers in a strange land, this theme surfaces throughout the album. This raises a few questions: How does a person escape this dystopia? Does OK Computer advocate escape from a physical setting or from a dysfunctional worldview? This document will explore these ideas thoroughly. While some of these songs are thematically unrelated to OK Computer, others offer additional insight into the album that is ultimately beneficial to the analysis of Radiohead as Plato’s noble lover. This EP was released in the United States on the heels of the commercial success of OK Computer. To adequately analyze the rhetoric of Radiohead in regard to Plato’s concept of the noble lover, we must examine Plato’s ideas about rhetoric and, more specifically, his “knowledge of the truth” (Lamoureux, 2001, p. 1). To Plato, man’s “principal end in life … is to practice philosophy and advance the cause of truth” (Golden, Berquist & Coleman, 2000, p. 25). Plato believed that absolute truth existed and could be known through dialectic, a rational dialogue that “distinguish(ed) truth from falsity and deception” (Yunis, 1998). Absolute truth could be found in “general ideas or concepts (that are) immutable because (they are) independently existing real things or entities” (Gwynne, No Date). Plato asserted that rhetoric was only a means of stating one’s opinion rather than a means for discovering absolute truth (Infante, Rancer & Womack, 1990, p. 506-507). This meant an orator could address the public without regard for absolute truth or the audience’s goodwill, and with potentially deceptive motives (Brogan, 1997). To Plato, this was completely abhorrent and irrelevant in a world where the pursuit of absolute truth was the utmost goal. In his book The Phaedrus, however, Plato shines light on a more honorable purpose for rhetoric in his discussion of “three lovers.” Plato derides two of these lovers: The evil lover, who “uses language to enslave and deceive another,” and the non-lover, who “fails to move us at all” (Golden, Berquist & Coleman, 2000, p. 18-19). Plato exalts the third lover—the noble lover—who operates out of the sort of “inspired madness” that results “when heaven sets us free from established convention” (Plato, 1973, p. 81). The noble lover is a selfless, audience-loving orator who possesses knowledge of the truth (“Of the eternal realities, the Forms and soul”) and speaks for the good of the people in order to lead them toward the truth (Plato, 1973, p. 79). Although Plato believed dialectic was the only way to reveal truth, this text “accounts for the possibility of a correlation between human speech and truth” (Brogan, 1997). How does Radiohead fulfill Plato’s definition of the noble lover? First, since the noble lover must lead the masses toward truth, he or she must possess the knowledge of truth. Using Plato’s Allegory of the Cave, we will establish Radiohead as possessors of the knowledge of truth. This will be followed with an analysis of OK Computer in comparison with Plato’s definition of a noble lover. “Behold! Human beings living in an underground cave, which has a mouth open towards the light and reaching all along the cave; here they have been from their childhood, and have their legs and necks chained so that they cannot move, and can only see before them, being prevented by the chains from turning round their heads. Above and behind them a fire is blazing at a distance, and between the fire and the prisoners there is a raised way; and you will see, if you look, a low wall built along the way, like the screen which marionette players have in front of them, over which they show the puppets” (Plato, 2001, p. 1). Next, Plato explains that when objects are projected onto the “screen,” they appear as shadows. Because these shadows are the only images the people see, they perceive these shadows as truth. If, however, a man is freed of his shackles, he is able to see the objects that are being illuminated by the fire. Furthermore, he is able to exit the cave and enter into the presence of the sun. If this man returns to the cave, his eyes are unable to adjust to the darkness therein. As a result, his peers reject him, saying, “Up he went and down he came without his eyes; and… it (is) better not even to think of ascending” (Plato, 2001, p. 4). According to Julia Annas (1997) in “Understanding and the Good,” “The Cave is Plato’s most optimistic and beautiful picture of the power of philosophy to free and enlighten” (p. 152). In this allegory, the sun is the truth, or the image of “the good” (Plato, 2001, p. 4). The cave itself is the “world of sight” which affords mankind only shadows of the truth” (Plato, 2001, p. 4). Once a person sees the sun, he has seen the truth in its purest form. Why, then, would a person return to the cave—to a place of lesser enlightenment—after seeing the sun? The answer is full of purpose and altruism: He must “return to the cave, and act there” (Thomas, 2001, p. 2). He must attempt to enlighten those who incorrectly perceive the shadows as truth. Based on the rhetoric of OK Computer, one can infer that Radiohead possesses something like the knowledge of truth. When Thom Yorke sings, “Wake from your sleep” in the song “Exit Music (For a Film),” in the context of the album, it is as if he is referring to the slumber of those who perceive the shadows as truth (Godrich, 1997). He has seen the sun and, in attempt to enlighten his listening audience, he seeks to awaken them from their complacent sleep. What is truth according to Radiohead? In this case, a description acts as a definition. In the Allegory of the Cave, the man’s perspective was permanently altered as a result of his encounter with truth. It is apparent that OK Computer, as a rhetorical composition, was composed from the perspective of one with this sort of altered perception. This is especially evident in the song “Airbag,” in which Yorke expresses this change in perception through the concept of being “born again.” “In a jackknifed juggernaut / I am born again,” Yorke sings. “In a fast German car / I’m amazed I survived. / An airbag saved my life” (Godrich, 1997). Yorke narrowly escaped a potentially fatal accident when he was seventeen. “Airbag” captures the “positive, wonderful emotion you feel when you’ve just failed to have an accident … There’s something joyous about it. Life seems more precious” (Clarke, 2000, p. 118). Perhaps this near death experience altered Yorke’s perception of reality. Perhaps his whole life flashed before his eyes, causing his priorities to spontaneously realign. He is jettisoned from the womb of meaningless clutter that entombed him in security and sterility. Much as the man in Plato’s Allegory of the Cave finds the truth upon exiting the cave, Yorke finds the truth in his brush with death. As a result, he is born again. He sees the world through new eyes. He goes on to sing, “In an interstellar burst / I am back to save the universe” (Godrich, 1997). Realizing that he possesses knowledge of the truth, he wishes to “save the universe” by imparting this revelation of truth unto anyone who will listen. Lyrics to the song “Subterranean Homesick Alien” also parallel the Allegory of the Cave. In the song, Yorke fantasizes about being abducted by aliens and discovering absolute truth. As if he exited Plato’s cave himself, or merely boarded the alien mother ship, Yorke concludes, “I’d tell all my friends but they’d never believe me / They’d think that I’d finally lost it completely / I’d show them the stars and the meaning of life / They’d shut me away” (Godrich, 1997). He discovers the truth and his peers reject him for his altered perception. According to NME, it is “as if Thom Yorke really is an observer from another galaxy rather than a neurotic resident of Oxford” (No Author, 1997, p. 2). While this lyric is fantasy based, it seems to be an appropriate allegory for the origin of the rhetoric of OK Computer. The album, as a cohesive whole, suggests that Radiohead has seen something like the Truth, resulting in a permanent alteration of perception. As a result of this altered perception—this encounter with truth—the band members’ eyes are opened to the true nature of the world around them. The picture of a dystopian world emerges. People live at a frantic pace, corporations transform humans into robots, politics manipulate and technology simultaneously saves and kills humanity. While others may be cognizant of these phenomena, at least on some level, Radiohead is philosophically impelled by the urgency of this ghastly picture. The altered perception also causes the members of Radiohead to feel like strangers in a strange land. As a result, the band dissociates itself from humanity, referring to other human beings as “weird creatures who lock up their spirits / drill holes in themselves / and live for their secrets” (Godrich, 1997). Furthermore, rather than equating the advancement of civilization with prosperity and progress, Radiohead only perceives a detrimental de-emphasis on the importance of interpersonal relationships resulting from an increase in busyness. This is apparent in the lyric of album B-side “Palo Alto,” which was originally titled “OK Computer.” “In the city of the future / it is difficult to find a space / I’m too busy to see you / You’re too busy to wait. / But I’m okay, how are you? / Thanks for asking, thanks for asking” (Godrich, 1998). This stoic, impersonal exchange reduces communication to mere function and, in the process, illustrates the dehumanization that is overtaking the world depicted in OK Computer. While the truth according to Radiohead is not as elegant or pure as that anything Plato would delineate through dialectic, it establishes a pedestal for the band to orate from as a noble lover of sorts. By possessing knowledge of the truth, Radiohead becomes capable of being a noble lover. How, then, does Radiohead fulfill Plato’s requirements for the noble lover? First, the noble lover orates from an “inspired madness” that results “when heaven sets (him) free from established convention” (Plato, 1973, p. 81). First, what does the phrase “established convention” mean? In this passage, it may to refer to traditional purposes for rhetoric, probably political in nature. Freed from these purposes, an orator is able to speak from a selfless podium. The same car crash that opens Thom Yorke’s eyes to truth additionally frees him from “established convention.” “Heaven” alters his perception of the world and incites altruistic madness within him. With “inspired madness,” Radiohead plays the role of Plato’s noble lover, speaking truth for the good of the people by enlightening listeners about the frantic pace of the world, the effect of the modern corporation on the human identity, the corrupt body politic, and the dual role of technology as humanity’s savior and saboteur. This enlightenment acutely sensitizes Radiohead’s listening audience to the gravity of the problems in the world and, accordingly, opens the door for Radiohead’s escapist rhetoric. The band addresses the frantic pace of the world in the song “No Surprises.” The consequences of higher productivity and maximum efficiency in the world are “a heart that’s full up like a landfill / A job that slowly kills you / (and) bruises that won’t heal” (Godrich, 1997). The modern world has no regard for the human heart. The human heart, however, beats nonetheless. In this fast-paced world, the heart becomes a junkyard filled with unsettled personal matters. In an interview, Thom Yorke explains, “All this stuff is getting buried, the debris of our lives. It doesn’t rot, it just stays there. That’s how we deal—that’s how I deal with stuff. I bury it” (Clarke, 2000, p. 123). When people are not burying the contents of their hearts, they are in transition, waiting for the next destination; the next stop on the subway, bus or plane. This transient feeling, invented by this day and age of modern transportation, is articulated in the song “Let Down.” “Transport, motorways and tramlines / Starting and then stopping / Taking off & landing / The emptiest of feelings” (Godrich, 1997). In the midst of this “transit zone feeling,” “you’re in a space, you are collecting all these impressions, but it all seems so vacant. You don’t have control over the Earth anymore” (Clarke, 2000, p. 121). Humanity is becoming empty because it is always moving and never stopping to reflect. OK Computer also discusses the effect of the modern corporation on the human identity. When the corporation hands a new employee the keys to the front door, it asks for the employee’s soul in exchange. As a result, the employee becomes the sort of character outlined in the song “Karma Police.” “Karma Police / arrest this man. / He talks in maths. / He buzzes like a fridge. / He’s like a detuned radio” (Godrich, 1997). According to vocalist Thom Yorke, the song is “dedicated to anyone who works at a big firm” (Clarke, 2000, p. 121). It resolves with the repeated refrain, “For a minute there I lost myself” (Godrich, 1997). Yorke barely escapes the white-collar world with his identity intact. This is a warning for everyone. According to Radiohead, the body politic relies on “riot shields and voodoo economics” to execute its agenda (Godrich, 1997). In the song, “Electioneering,” plastic smiles plastered on politicians’ faces punctuate slogans like, “I trust I can rely on your vote” (Godrich, 1997). The body politic no longer addresses the concerns of the people, and achieves its objectives through corrupt means. The album makes listeners aware of technology’s dual role as savior and saboteur. In a car crash in “Airbag” and a plane crash in “Lucky,” technology is the vehicle that transports humankind to work and to an early grave. Additionally, technology steals the human voice in the song “Fitter, Happier,” which is narrated by a computerized voice. Perhaps the android in the title of the song “Paranoid Android” is the owner of this voice. Regardless of its origins, one can only speculate about how people would fare against androids. According to Radiohead, technology is here to advance us, but also to outperform us, overtake us, and obliterate us. After enlightening listeners about the true nature of the world and its business, politics and technology, Radiohead plays Plato’s noble lover by persuading its listeners to escape the dystopia that is the modern world. The first step in the band’s persuasive process involves adding a sense of urgency to its message. In “Climbing Up the Walls,” Radiohead saturates the air with neurotic paranoia that appears to be personal in nature, but perfectly matches the anxiety of living in the modern world” (No Author, 1997, p. 2). “Either way you turn I’ll be there. / Open up your skull, I’ll be there. / Climbing up the walls” (Godrich, 1997). In “Paranoid Android,” the physical and psychological noise of the modern world becomes unbearable. Yorke sings, “Please could you stop the noise? / I’m trying to get some rest / from all the unborn chicken voices in my head.” The modern world introduces pervasive neuroticism into humanity’s vocabulary, and the result is a feeling of emotional claustrophobia. What can a person do in the face of claustrophobia but escape? This appears to be Radiohead’s intention. Using language and imagery that invades and entraps, but simultaneously illuminates the truth, the members of Radiohead point us toward the escape hatch and dare us to follow them through it. The most obvious directive is found in the album’s closing song, “The Tourist.” Over a swelling, emotive, bass-driven melody, Yorke wails, “Hey man, slow down! / Idiot, slow down” (Godrich, 1997). Regardless of Radiohead’s message, the world will continue to accelerate. However, individuals who are willing to take heed of the band’s prophetic warning may be able to escape the dystopia of the modern world. Outside of the sprawling metropolitan areas and the reach of business and commerce, there are quiet, remote locations where humanity can live, unhindered by the trappings of the modern world. “The Tourist” seems to be the culminating message of OK Computer. Furthermore, its warning to slow down is amplified in the context of the high-speed car crash that launches the album” (Clarke, 2000, p. 123). In “Let Down,” Yorke fantasizes about escaping the aforementioned “transit zone feeling” with the line, “One day I’m going to grow wings” (Godrich, 1997). In this instance, as well as in others on the album, escape is figurative rather than literal. Yorke appears to be persuading his audience of the importance of fantasizing as a means of escape. In order to escape the political disarray of the modern world, Yorke sings, “Bring down the government. / They don’t speak for us” in “No Surprises” (Godrich, 1997). In the context of the song, this directive seems innocent and whimsical. However, in the context of the album as a cohesive whole, Radiohead attempts to persuade its listening audience of the need to escape political convention and empower a political authority that speaks to the human condition. The song “Fitter, Happier,” narrated by the digital throat of a Macintosh computer-generated voice, is concerned with psychological escape from the dystopia through self-improvement. According to Martin Clarke, it is “a two minute litany of platitudes to aim for in a perfect modern life—advert slogans, media myths, lifestyle ideals and so on” (Clarke, 2000, p. 121). With lyrics like “Fitter, happier / More productive / Comfortable / Not drinking too much / Regular exercise at the gym,” the song espouses the virtues of escaping the overindulgences of the modern world (Godrich, 1997). As the song progresses, the lyrics become more personal. “Still cries at a good film / still kisses with saliva / no longer empty and frantic / like a cat tied to stick” (Godrich, 1997). The robotic narrator reinforces the depiction of a world that has no regard for the human heart or individuality, but paradoxically depends on human beings for it operations. In “Exit Music (For a Film),” Yorke sings “Wake from your sleep / The drying of your tears / Today we escape / We escape.” At the end of the song, Yorke concludes, “We hope your wisdom and rules choke you,” as if he has discovered that this escape is not possible. Aliens are not going to abduct him. He is not going to grow wings. He is not going to bring the government down. Self-help books cannot make the world disappear. Because it is impossible to actually escape this world short of suicide, fatal accident, nuclear war, or space travel, it becomes apparent that the escape that Radiohead preaches of is more of a state of mind than anything else. It is an acceptance of the dystopia, but a rejection of the very things that comprise it. It is a dissociation from the modern world that recognizes that we are part of a unique symbiosis with the world around us, yet does not maintain that we adhere to the values or goals of the dystopia. Radiohead speaks for the good of the people by alerting them to the truth about the world and persuading them of the importance of this escapist state of mind. And lest humanity forget the message of OK Computer, the song “A Reminder,” released as a B-side on the Airbag/How Am I Driving? EP, supposes that Yorke “gives in” to the modern world despite his convictions. While it reads as a message to a significant other in the future, it dually acts as a reminder from the narrator’s present self to his future self to embrace the truth (Godrich, 1998). If I get old I will not give in. If I do, remind me to pray. hold me into this song. Knock me out. Smash out my brains. If I get old remind me of this. That night we kissed and I really meant it. Thus, as the future man has long envisioned overtakes the present, Radiohead is the noble lover who recognizes humanity’s perils and makes it realize that we do not have to be casualties of the modern world simply because we inhabit it. This truth, much like the truth Plato explores, benefits the human race through its immediate application to the frenzied modern world. OK Computer reminds humanity that it does not have to fall victim to the monsters it creates. Escape is possible. Annas, J. (1997). Understanding and the good: Sun, line, and cave. In R. Kraut (Ed. ), Plato’s Republic: Critical essays. (pp. 143-168). Lanham: Rowman & Littlefield Publishers, Inc.
Brogan, W. (1997). Plato’s dialectical soul. Research in Phenomenology, 27, 3-16. Clarke, M. (2000). Radiohead: Hysterical and useless. London: Plexus Publishing Ltd. Gee., G. (Director). (1998). Meeting people is easy: A film about Radiohead [Film]. Hollywood: Capitol Video. Fricke, D. (1997). Radiohead: OK Computer. In Rolling Stone Magazine [On-line]. Available: http://www.rollingstone.com/recordings/review.asp?aid=321 60&cf=236 [2001, November 20]. Godrich, N. (Producer). (1997) Radiohead: OK Computer [Compact Disc]. Hollywood: Capitol Records. Godrich, N. (Producer). (1998) Radiohead: Airbag/How am I driving? [Compact Disc]. Hollywood: Capitol Records. Golden, J.L., Berquist, G.F. & Coleman, W.E. (2000). The Rhetoric of Western Thought (7th ed.). Dubuque: Kendall/Hunt. Gwynne, R. (No date). Classical rhetoric [On-line]. University of Tennessee at Knoxville. Available: http://web.utk.edu/~gwynne/classical.html [2001, Sept. 15]. Infante, D.A., Rancer, A.S., Womack, D.F. (1990). Building Communication Theory. Prospect Heights: Waveland Press. Lamoureux, E. (2001). Plato [On-line]. Bradley University. Available: http://bradley.edu/~ell/plato.html [2001, November 20]. Neufeldt, V., & Guralnik, D.B. (Eds.). (1996). Webster’s new world college dictionary. New York, NY: Macmillan, Inc.
No Author. Radiohead: OK Computer. In NME Magazine [On-line]. Available: http://www.nme.com/NME/External/Reviews/Reviews_Story/0,1069, 14,00.html [2001, November 20]. Plato. (2001). Plato’s allegory of the cave [On-line]. Plotinus.com. Available: http://www.plotinus.com/plato_allegory_of_the_cave.htm [2001, November 20]. Schreiber, R. (1997). Radiohead: OK Computer [On-line]. Pitchfork Media. Available http://pitchforkmedia.com/record-reviews/r/radiohead/ok-computer.shtml [2001, November 20]. Thomas, B. (2001). Allegory of the cave [On-line]. Simone Weil Home Page. Available http://rivertext.com/weil4a.html [2001, November 20]. Yunis, H. (1998). A philosophical approach to Aristotle’s Rhetoric. International Journal of the Classical Tradition, 4, 396-401. Previous postWhat Werner Herzog Got in Zee Mail From Us Next postAn Open Letter to Everett True: 5 Songs from the Boy Who Listened to "Nerdvana"